- Meet in Menara Airport then transfer to hotel. - Dinner & overnight stay in Marrakech hotel. - Visit Essaouira, Oualidia, El Jadida & the Portuguese Cistern. - Late arrival to CAsablanca, dinner & overnight. - ٍٍٍٍٍٍٍٍٍٍٍFull day ofsighteeing to historic sites first in Casablanca then Rabat. - Late check in Rabat hotel, dinner & overnight. - Morning transfer to visit Meknes and Volubilis. - Afternoon arrival to Fez, dinner & overnight in Fez hotel. 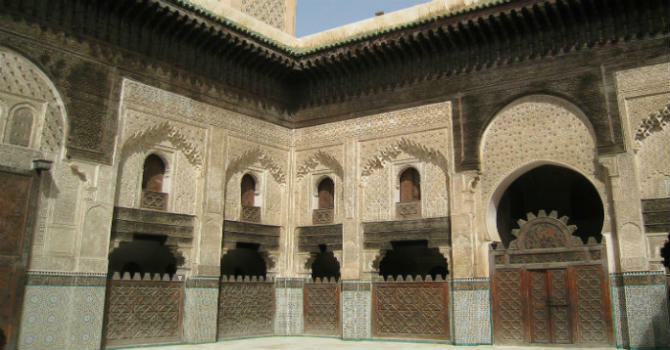 - Full day of sightseeings and visiting the historic attractions of Fez..
- Overnight stay in Fez hotel. - Breakfast in hotel then drive back to Marrakech. - Stops to visit Imouzer, Ifrane & Beni Mellal. - Full day of sightseeing to Marrakech historic attractions. - Overnight stay in Marrakech hotel. - Drive to Casablanca airport for the flight back home.